Buddha Board Gift Card is based on the Zen concept of living in the moment. You simply paint on the surface with water and your creation will come to life in bold design. Then, as the water slowly evaporates, your art will magically disappear leaving you with a clean slate and a clear mind - ready to create a whole new masterpiece. 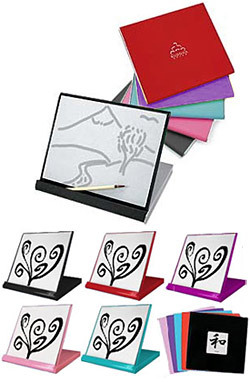 Buddha Board is also environmentally friendly and will last for years with proper care. Allow yourself to 'let go' and not be concerned with each outcome - live for the moment and enjoy! One of this season's hottest gifts! The elegantly packaged 5-inch square Buddha Board incorporates the "magic" painting surface and folds back onto its own small easel stand. It comes with a brush and ten special-occaison stickers (for birthdays, peace, romance, Christmas, tranquility, joy and more) that sender can apply to personalize the cover. Made of thick plastic with a gloss finish, it is offered in five colors, comes with its own painting brush and is accompanied by an elegant black envelope.